Israeli food is gaining traction in L.A., and Café Florentine is an under-the-radar spot that serves some of the city’s best versions. Earlier this year, the restaurant replaced Shawarma Dadon on an increasingly enticing strip of Valley Village that also includes Mirabelle Wine Bar and Chiangmai Urban Thai Kitchen. Chef Ofir Arbel hails from Atto in northern Israel and spent the last 12 years in Tel Aviv, including four years overseeing 40 branches of Café Café (Israel’s equivalent to Cheesecake Factory). He visited his brother in L.A. and fell for the city (and a woman). Arbel teamed with business partner Liran Sankesh, a seafood wholesaler who runs the Kosher sushi restaurant Sushiko on Pico Boulevard’s Kosher Corridor. Arbel learned thousands of dining preferences in Israel while working for a popular chain, but L.A. poses new challenges. He’s no longer part of a juggernaut that outsources production. Here Arel and his team have to make everything by themselves. Recreating go-to recipes can also be problematic, since the variety of Kosher ingredients is far more limited than in Tel Aviv. Café Florentine’s simple space features white walls lined with mirrors and menus, a stone counter, and small patio along Burbank Boulevard. The name refers a trendy Tel Aviv neighborhood called Florentin that’s become known for street art. 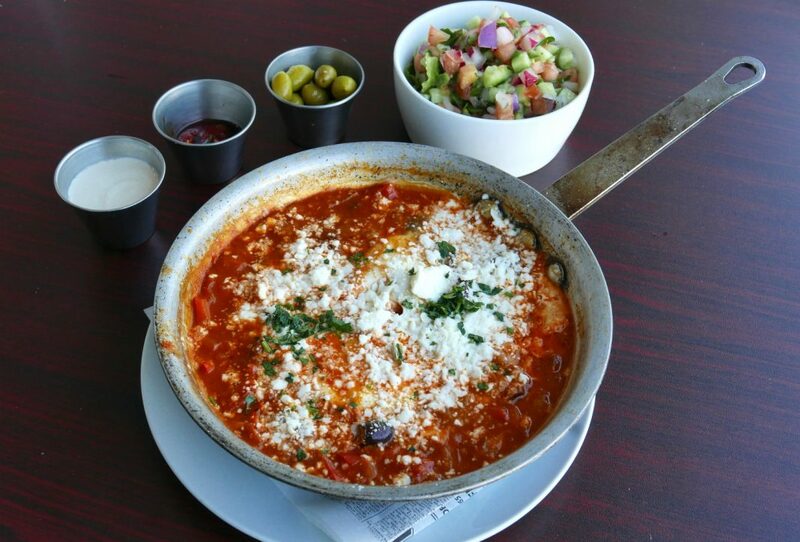 Arbel serves three different skillets of shakshuka, the increasingly ubiquitous baked tomato sauce and egg dish. Café Florentine’s shakshuka still stand out. In the Florentine Shakshuka, a pair of poached eggs swim in spicy house-made tomato sauce crafted with Roma tomatoes, caramelized onions, bell peppers, and “secret” spices, simmering for two hours. Signature touches include smoky Baladi eggplant (burnt eggplant minus seeds, which cause bitterness), Kalamata olives, salty Feta cheese, oregano, and parsley. Italian Shakshuka also incorporates poached eggs, spicy tomato sauce, and Feta cheese, but subs pesto, molten mozzarella, and roasted peppers for Baladi eggplant, Kalamata olives, and oregano. The skillet is similarly well balanced. Each shakshuka comes with punchy green olives, nutty tahina, and spicy harissa and a choice of soft, sesame-studded, horseshoe-shaped baked Jerusalem bagels (baked, but not boiled), ciabatta, a vibrant chopped salad, or mixed green salad. Sandwiches also come on Jerusalem bagels, which embrace fillings like soft gloves. 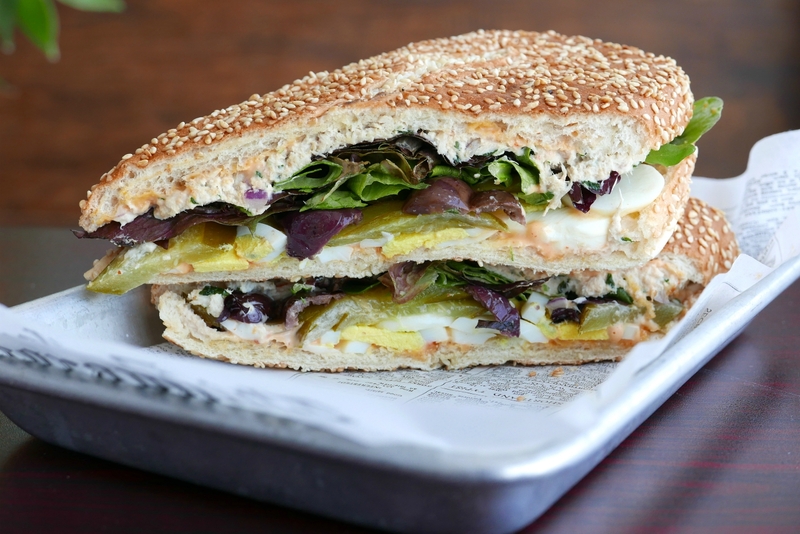 The Tunisian sandwich is stacked with juicy tuna salad, hard-boiled egg, red onions, tart pickles, briny Kalamata olives, judiciously spicy chile aioli, and mixed greens. Challah French toast with crème fraiche and halva spread and baked salmon served atop creamy harissa risotto also beckon, but a person can only eat so much. Café Florentine also serves a killer Kanafe, Malabi & Ricotta dessert with kataifi (shredded phyllo) blanketing ricotta and malabi (floral pudding seasoned with rose water), topped with crushed pistachios, served on a sizzling cast-iron skillet. To drink, there’s an aromatic Sahlab that combines milk, rose water, and walnut and arrives dusted with cinnamon, crushed pistachios, and shredded coconut. Stir to integrate all of the complementary flavors. Arbel and Sankesh recently added Street Café by Aroma in Encino to their portfolio, replacing Aroma with another Kosher option. In the next couple years, Arbel plans to add three more restaurants to the mix that also serve Israeli food with global influences while employing more Jewish people.